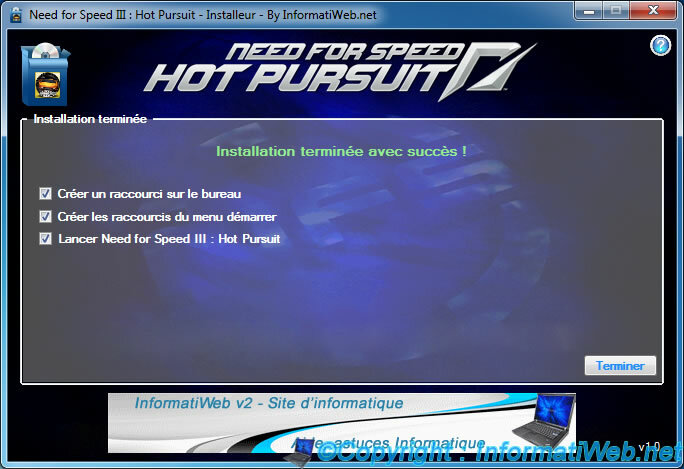 NFS III : Hot Pursuit Installer is a program that allows you to install and uninstall the game "Need For Speed ​​III : Hot Pursuit" created by "Electronic Arts", if you have the CD to install this game. If we created this unofficial installer / uninstaller, it's simply because the original installer is coded in 16 bits and 16 bits isn't supported on the OS (such as Windows, Linux, Mac , ...) 64 Bits. Nevertheless, the game is coded in 32 bits and can therefore run on OS 32 or 64 bits. The installer / uninstaller has been translated also in these 5 languages ​​for better comfort during installation and uninstallation. Your installation CD contains only 2 or 3 languages ​​listed above depending on the country where you purchased this game. Once the game is installed, you can create shortcuts for the start menu and / for the desktop. And start the game automatically when closing the installer. The game can be uninstalled in the same way as any program. - By the Control Panel. 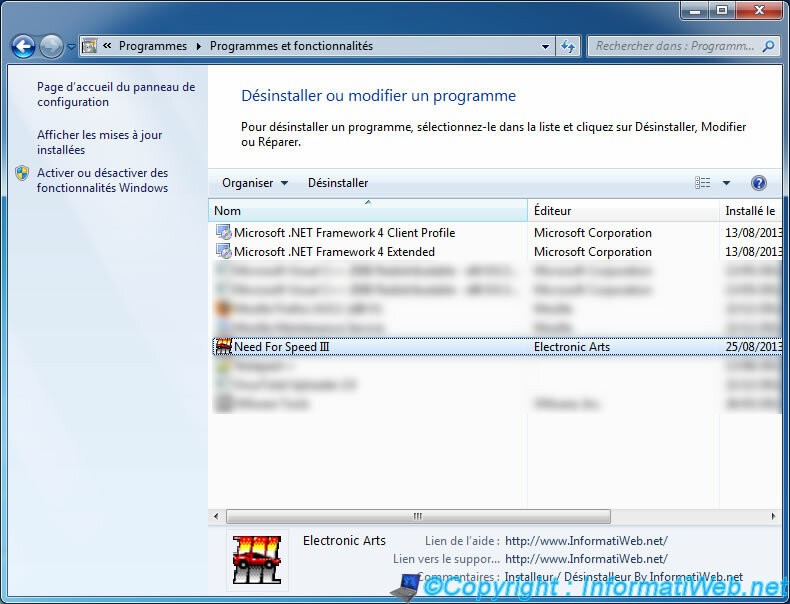 Windows Vista, 7 and 8 : Link "Uninstall a Program" located in the "Programs" category. Note : We've added some information in the uninstall key to display the icon of the game, the publisher and the address of the technical support that were not present with the original installer. Once you click on "Uninstall", our installer will launch automatically in uninstaller mode. If all goes well, the message "Uninstall successfully completed" will be displayed (in the language in which the game was installed).